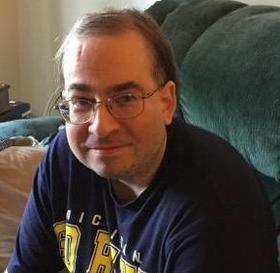 Noah Huffman, 40, of Traverse City, Michigan went home to be with the Lord December 7, 2018 due to complications from a stroke. He was born in Monroe, Michigan on November 16, 1978, the youngest of four children of Ingram and Nancy (Norin) Huffman. He graduated from Central Lake High School in 1996. He attended and was baptized at Journey Wesleyan Church, Traverse City. Noah is survived by his mother Nancy and stepfather Ken Patton of Central Lake, Michigan; siblings Lee (Cindy) and Joel (Cheryl) Huffman of Monroe, Heather (Ernest) Shafer of Rossford, Ohio; stepbrothers Kevin and Kenn (Jeannie) Patton of Florence, South Carolina; nieces Tonya (Christopher) Lands, Brittany Huffman, Christina (Ryan) Fancsal, Maegan Huffman, Kendyll Shafer, Anna and Samantha Patton; nephews Garrett, Gavin, Landon, and Jonah Shafer, Mitchell and Daniel Huffman, Enos and Jesse Patton; many cousins; and his girlfriend Marci. His cat Charlie will miss him too. Noah was preceded in death by his father in 1987. The family would like to acknowledge the special assistance provided by his various caregivers over the years, which allowed Noah to lead an independent life. No services are planned. Memorial donations can be made to either Make-A-Wish Michigan (http://michigan.wish.org/), which Noah benefited with a trip provided to Disney World or to Camp Quality Michigan (http://www.campqualityusa.org/MI) which Noah attended several times following cancer treatment. Please sign the guestbook and share your thoughts and memories with the family.